When discussing roleplaying games with gamers you don’t know all that well, you often run into a cliche. You get the people who say they don’t like the games, they like the storytelling. A common variation is “in my group we practically don’t roll the dice at all”. It’s like rules are filthy. Something you want to get away from, something you elevate yourself above of. People actually compete on how little rules they use. And maybe that’s right for some of those people. Maybe they are better off just freeforming. But having seen over a hundred players in my table by this day, I do say the vast majority of players are happier with a set of rules, no matter what they say. To exchange a cliche with another – it’s not the tools, it’s how you use them. That’s all just my way of saying “let’s forget about that argument for now”, because I want to discuss rules. In my recent games I’ve had a lot of mechanical, game rules-y twists as experiments. I think it really started with skill challenges in Dungeons & Dragons, but my fascination with rules and mechanics goes back much farther than that. In our current D&D campaign our heroes have a backstory of being insect hunters. To begin with we didn’t even outline what that meant, later on we agreed that they catched bugs and sold them. It’s been just words, really, up until now. I knew I wanted to make it more relevant to the game, and I wanted the players to get something out of it. I felt like I had been abusing the concept because it hadn’t been explored at all. The players were supposed to buy into it, yet it held nothing of substance. My first instinct was to make an adventure out of being insect hunters, but that would’ve taken away from our focus on the heroes’ epic – they already have heroic (tier) goals and I didn’t want to make anything that should be heroic feel pedestrian. No, the insect hunting would be compartmentalized. A lighter option would be to use light roleplaying and vignettes to establish what it’s like running a store, hunting for insects, much like you might do in establishing shots in a movie. It wouldn’t have really changed anything, though. What I really got into was the idea of turning their backstory into a game. I was inspired by Recettear: Item Shop’s Tale. So I put together a set of rules on how to run an insect shop in a fantasy town. The players had to decide who’s doing what over the mornings and afternoons of a week of running the store. They would come back from their adventures and their shop clerk (who they had to detail beyong the name I gave him) would be furious, having had to close up shop the previous week because the shelves were empty. They needed inventory: various insects for the different customers (eight kinds, from children to adventurers to elves), requiring different kinds of hunting trips to catch them. They needed someone to man the counter, someone to clean up the place, several someones to handle marketing. It was fun to get to combine some of my real-life background in marketing with the game! They would arrange sales and wonder what to do about their ridiculous overstock of critters for women. They discovered new things they’re good at. Over the course of the week, the players made all the notes of inventory levels, income and expenses, and tallied up their revenue at the end of the week. When we began the game, I had no idea if they would like it or not, but it turned out everyone really got into it. The game basically ran itself for the around 90 minutes we spent on the shop. I did a couple of things I would use again. 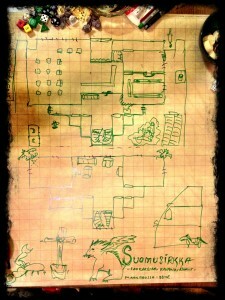 First, I made the players describe and draw up the map for their multi-story store. This grounded everyone and provided a visual focus for the game. Then I opened up the game by running a fight in the store, making it considerably more real than “just” something they came up on the fly. We gave it substance. Second, the shop game wouldn’t have worked unless the players did all the accounting and note taking. It couldn’t be my show or nobody would’ve cared. Always give the new fidgety bits for the players to take care of. They’ll appreciate it more and be more involved, plus it makes things easier for you. Third, the rules for the game were not really good. I only wrote them up the previous night and decided against a playtest. I knew they would break, but I also knew (just based on experience with mechanics) they were good enough for the one go. I did have to adjust things on the fly, too. But because there were meaningful decisions and plans to make, it felt good enough. It didn’t matter that with just a little bit more thought it would’ve been easy to exploit the way it was set up. When planning something disposable like this, don’t over-do it. Focus on what the players can see and affect. I don’t think we ever need to go back to the insect shop. It’s been established powerfully, and it has a place and meaning in the players’ minds. And that’s all thanks to mechanics.